The sports complex expenditures were included in the capital improvement plan (CIP) reviewed by aldermen at a work session January 30, but no council members commented on the sports complex line items nor the sports complex plans or the impact it would have on tax rates and city debt. The lack of on-the-record discussion about the sports complex was likely because aldermen were given a 16-page overview of the so-called "WOW" Project at the January closed door sessions. The briefings were held with aldermen in small groups to avoid having a quorum (4) of aldermen present at one time, thus triggering open meeting laws that prohibit elected officials from conducting city business behind closed doors. Subsequent to those sessions, the budget was revised, adding millions to the capital improvement plan for streets, sewers and stormwater improvements for the sports complex, as well as funding a $5 million forgivable loan and 20-year Tax Increment Financing (TIF) rebates for developers. The city has scheduled the fiscal 2017-18 budget for a public hearing and approval Tuesday (March 7). Eventually, city staff is expected to bring forward a development agreement outlining the city and developer financial commitments for the project. However, terms in the development agreement are not expected to differ much, if at all, from the bond, loan and capital improvements schedules already outlined in the proposed budget. Mayor Gallagher told reporters at the news conference the city was considering a $10 million contribution to the project, while Kratz said he was looking at investing $7 million to $12 million in the indoor/outdoor sports complex. Kratz said he was still working to finalize financing for the project through local banks, including Triumph Bancorp, Inc., on whose board of directors he serves. The sports complex is targeted for the southwest corner of I-80 and Middle Road – arguably the most highly visible commercial location in the Iowa Quad Cities area. • Issuing $3.2 million in general obligation bonds that would be paid by through the city's property tax and gambling revenues. • Issuing $2.3 million in Urban Renewal General Obligation bonds to pay for the forgivable loan, parking paving and future acquisition of land for an aquatic center/waterpark. The urban renewal bonds would be paid back through the city's debt levy. • Issuing $5.9 million in Tax Increment Financing (TIF) bonds for the project development costs. The bonds would be paid back through the "incremental" property taxes on the sport complex, which would require a minimum assessment of $27 million in order for the higher taxes to cover the bond principal and interest over the 20-year life of the notes. The additional city debt for the sports complex in the proposed city budget for 2017-18 will push the city's debt to $127 million (73 percent of the city's legal limit). The $5.9 million in TIF revenue bonds are not included in the debt margin calculation – one reason the city chose that option. Otherwise, the the city's debt margin would exceed 76 percent. City officials are betting on other projects (hotels, restaurants) adjacent to the sports complex to generate significant revenue for the city, including $222,000 a year from a "voluntary" head tax on hotel room rentals, up to $250,000 a year in additional hotel/motel tax revenue, plus higher sales tax. Developer Kratz has been pushing the city to finalize its portion of the development so construction on the project can begin this spring. City officials in the January briefing said the plan called for all city infrastructure – sewer extensions, streets and stormwater retention – to be completed by this fall. 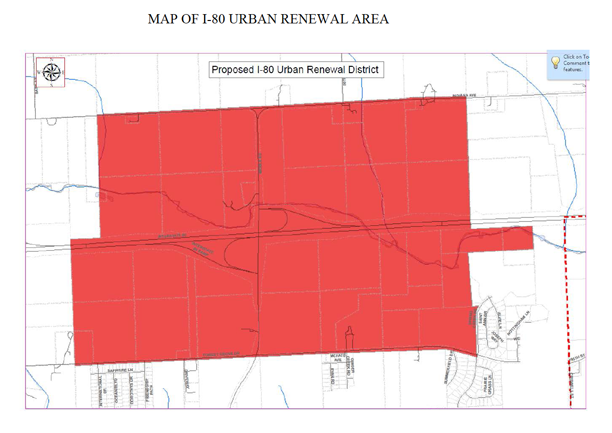 Establishment of a new urban renewal area encompassing hundreds of acres on all four corners of the I-80 and Middle Road intersection already is on the council agenda for this week's council session. The urban renewal area would allow the city to provide TIF and loan incentives to projects within the area, which includes the city owned land on the northeast corner of the intersection. If approved by the council as expected this week, a hearing would be held in April with other taxing bodies, the county and school districts, to explain the reasons for establishing the urban renewal area and how it would impact their anticipated tax revenues. Under a TIF/urban renewal area, a base valuation is established and any "incremental" property taxes generated by the higher property value/assessments are directed to the city and/or developer rather than to the other taxing bodies. In the case of the sports complex, a full 20-year 100 percent TIF is planned, meaning the school districts and the county would not receive taxes on the "incremental" value of the project for 20 years. The additional city debt for the sports complex has already been placed in the proposed city budget for 2017-18. It will push the city's debt to $127 million (73 percent of the city's legal limit). The $5.9 million in TIF revenue bonds are not included in the debt margin calculation, one reason the city chose that option. Otherwise, the city debt margin would exceed 76 percent.